Dirt Devil’s Swift stick vacuum provides consumers with convenience in a nicely compact vacuum cleaner. The Swift stick utilizes a conveniently compact design that fits easily into any size living space, from very small to much larger homes. Apartment and dorm dwellers can really appreciate the size of the Swift stick while larger home owners can use it as a supplemental vacuum. The unit is equipped with a convenient easy empty dirt cup that allows consumers to keep the unit running at optimum levels with minimal effort. The Swift stick vacuum is packaged with an on board crevice tool to give consumers more cleaning options when getting around and behind furniture and cushions or when working in corners. The unit is designed to be light weight so it is easy to grab and use for a quick clean. The portable design is also ideal for anyone who may not be capable of lifting a heavy full sized vacuum. 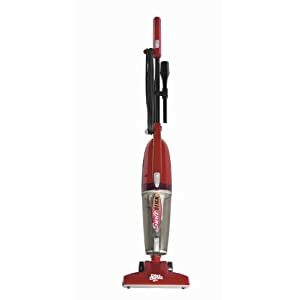 Each Dirt Devil Swift stick vacuum is constructed with a 16 foot power cord as well as a strong metal handle. The unit is great for cleaning smooth flooring as well as carpets. It can also be altered to use as a hand vacuum for smaller cleaning jobs. The Dirt Devil Swift stick vacuum cleaner gives consumers more options in a compact design. What did customers who bought Dirt Devil’s Swift stick vacuum like? Many consumers loved how effective the Swift stick vacuum was when used on dirty hard wood floors and other smooth surfaces. The unit stays mostly cool, even when used for more than 30 to 40 minutes in most cases. The compact, lightweight size and design is a great fit for small living spaces, such as dorm rooms or apartments. Emptying the dirt and debris from the collection compartment is very easy and takes no time at all. What did Dirt Devil’s Swift stick customers dislike? The Swift stick makes noise like most standard vacuums. This can be a bit loud in some situations and can limit when the vacuum can be used without becoming a disturbance. Some consumers had issues with the power of the Dirt Devil Swift stick. It seemed unable to do many larger cleaning jobs or handle carpet vacuuming. Small vents that are intended to help filter debris can actually cause a majority of debris to remain on floors rather than making it into the collection compartment. Cleaning the Swift Stick’s filter can be very troublesome and must be done to prevent the unit from becoming clogged and losing suction.